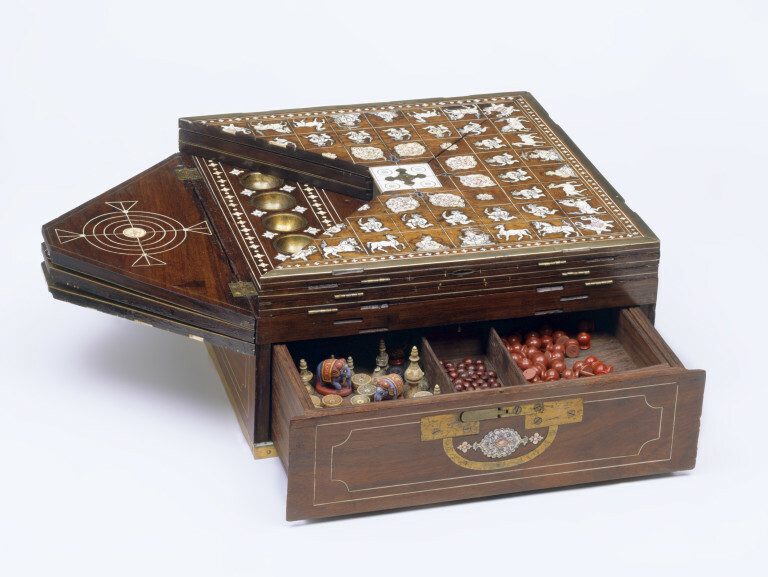 This games box originated at the court of the Maharaja Krishnaraja Wadiyar III. He was ruler of Mysore from 1794 to 1868 and a skilful games player. His abiding interest in the board games of his own country led him to develop both variations of existing games and entirely new ones. The 11 games in this box vary from complicated to very simple. The inlays suggest that the box was originally issued with ornate pieces that were kept in the two storage drawers. 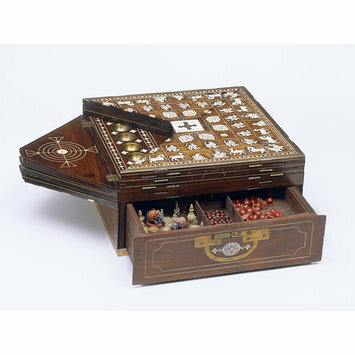 Games box, blackwood, inlaid with ivory, with lacqured brass mounts. The box has a draw for games pieces and fold out sections on the top to accomodate different games. This compendium of games is cleverly designed to accomodate four different South Indian games, with drawers for the pieces. The recessed mounts are clearly influenced by contemporary campaign furniture, which was widely used among the British in India during this period. Rosewood games box inlaid with ivory and with brass mounts, Mysore (South India), early 19th century. Jaffer, Amin, 'The Furniture of Play : Games Boards and Boxes in India' in Topsfield, Andrew (ed), 'The Art of Play : Board and Card Games of India', Mumbai, Marg Publications, 2006. pp.128-9 and 134-5.